The exterior may look practically identical to the previous model, but the interior is much more refined. Mazda has been teasing a mysterious reveal for this week’s New York Auto Show. While we were hoping for an outlandish concept or an all-new model, Mazda instead revealed the mildly-updated 2019 CX-3. While the exterior looks nearly identical to , on closer inspection there are some subtle changes including a newly designed front grille, chrome accents, 18-inch aluminum wheels, restyled LED taillights and a new Soul Red Crystal paint option. More significant changes can be found in the new interior, however. 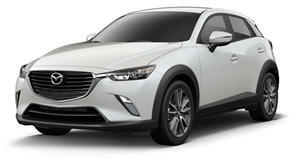 There’s now a central armrest, and Mazda has also fitted an electronic parking brake that increases the storage space. Elsewhere, the CX-3’s front seats have been fully redesigned offering improved support, and higher-trim models can be equipped with full leather seat upholstery for the first time in either white or black. A suede-like material has also been applied to the dashboard and door trims along with red louver accents around the air vents, and a center armrest with built-in cupholders has been added for rear-seat passengers. Powering the 2019 CX-3 is a more refined version of Mazda’s SKYACTIV-G 2.0-liter direct-injection gasoline engine, which now delivers 148 horsepower and 148 lb-ft of torque. Mazda says it has retuned the unit to increase torque across the RPM range, improve fuel efficiency and reduce internal friction. Complementing the revised engine is Mazda’s G-Vectoring Control technology, which uses engine timing to control chassis dynamics, leading to smoother, more accurate steering. The suspension and power steering has also been fine-tuned, and new 18-inch, low-profile tires have been developed to better absorb shocks from road surfaces and reduce braking distances. The 2019 Mazda CX-3 will go on sale this spring, with full specs and pricing to be announced at a later date.